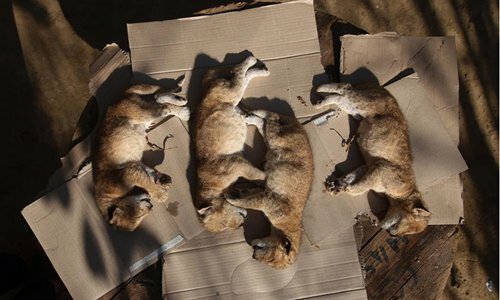 A wave of a severe coldness swept the region over the past two days, leaving the death of four new-born cubs in a zoo in Rafah city in southern Gaza Strip. 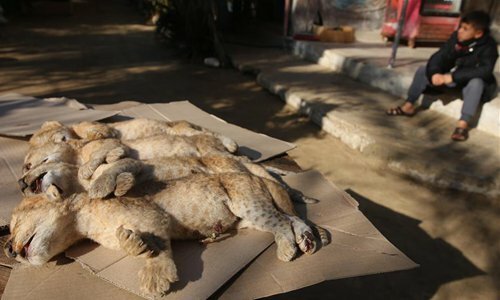 Fathi Jumaa, one of the zoo's owners, told reporters on Friday that "a lioness called Laila had given birth to four cubs on Wednesday morning; two of them died immediately and the two died later." The zoo owner explained that when he waked up on Wednesday at dawn time to look after the lioness mother, he was not expecting the mother's delivery. He was surprised when she gave birth to four cubs. "Two cubs died directly, so I took the other two babies to my house to keep them warm. Then, I brought them back to their mom to get breastfeed, but they died," Jumma added with sadness. He pointed out that he intended to sell the cubs so that he could feed the rest of the animals in the zoo and protect the zoo that has been continuously exposed to raids and wars waged by the Israeli army against the blockaded Gaza Strip. Jumaa has appealed to the associations of animals welfare to rescue the other animals, including cubs, monkeys and other rare birds. A local Gaza-based committee to resist the Israeli blockade has warned in an official statement late on Thursday that 12 years of a tight Israeli blockade have led to a severe humanitarian determination in all aspects of life in the Gaza Strip. The committee said in a press statement that 90 percent of factories in the impoverished densely populated enclave have been badly damaged due to the Israeli blockade and the growing rates of unemployment among young men. The committee showed that the per-day income of the Palestinian individual in the Gaza Strip, which has a population of around 2 million people, was only 2 U.S. dollars, adding that 85 percent of the people are living under the poverty line. Not only the Israeli blockade, which exhausted the Gaza Strip, but also 12 years of internal split between Hamas movement, which rules the enclave, and Palestinian President Mahmoud Abbas' Fatah movement have badly influenced the situation there, according to observers.